— Fifty years ago, after NASA completed its investigation into a fire that claimed the lives of three of its astronauts on the launch pad, the space agency stored the scorched remains of its first crewed Apollo spacecraft out of view at its research center in Virginia. 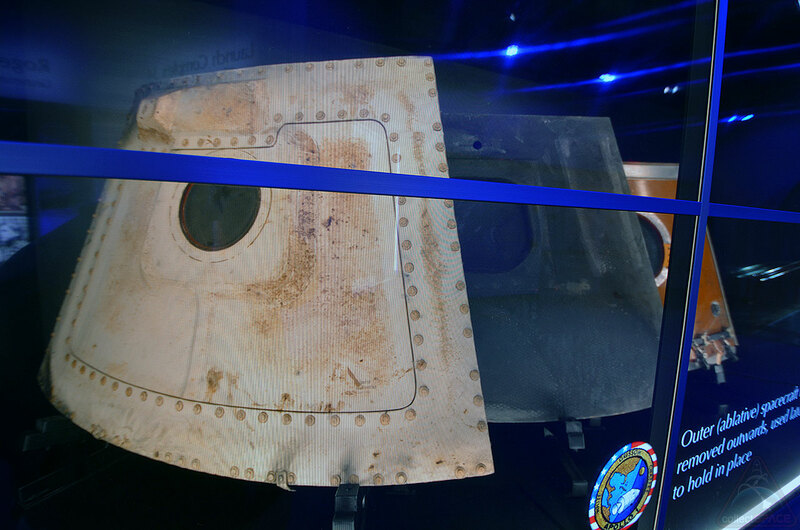 Now, half a century after the tragedy, NASA has placed on display the three hatches from the flame-damaged Apollo 1 command module, marking the first time any artifact from the capsule has been on public view. 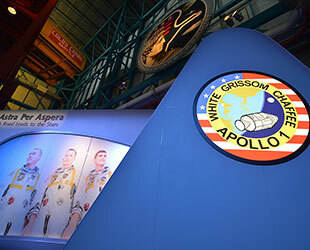 The exhibit, located at Kennedy Space Center Visitor Complex's Apollo/Saturn V Center in Florida, is dedicated to the memories of Virgil "Gus" Grissom, Edward White II and Roger Chaffee, who died behind those same hatches on Jan. 27, 1967. "We have gone too far without a memorial for Gus, Ed and Roger here," said Robert Cabana, director of the Kennedy Space Center and a former astronaut. "In cooperation with the families of the Apollo 1 crew, we're opening a tribute at the Saturn V facility to honor them, 'Ad Astra Per Aspera: A Rough Road Leads to the Stars.'" The solemn, but also inspirational exhibit now occupies the far end of the same building where NASA displays one of its three remaining 363-foot-long (110-m.) Saturn V rockets that sent astronauts on the moon. 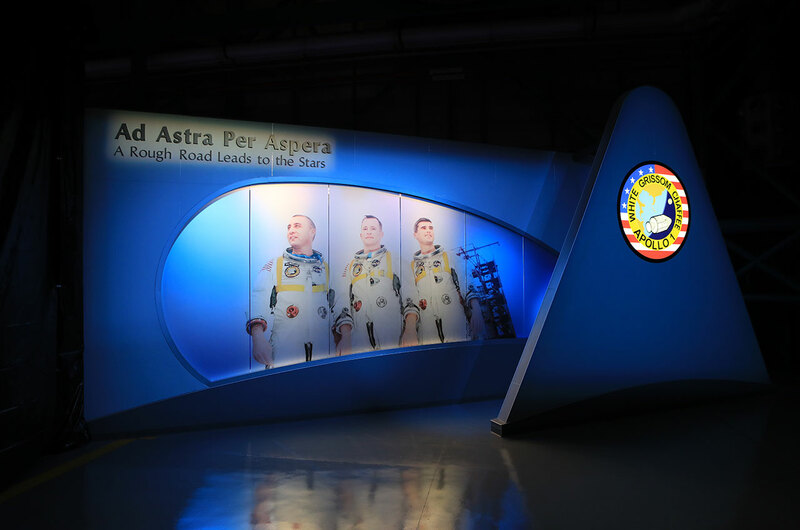 "Ad Astra Per Aspera" steps the public, both literally and figuratively, from one of the darkest days in the U.S. space program's history to the cusp of its crowning achievement. "It is a fitting tribute to the Apollo 1 crew, those who tried to save them and those who took us to the moon," described Cabana. 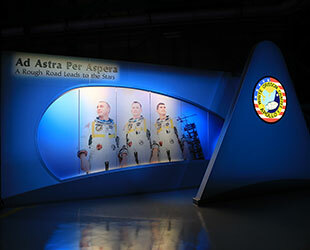 The first thing that the public encounters at the entrance to the new "Ad Astra Per Aspera" exhibit is a larger-than-life photograph of the three astronauts. 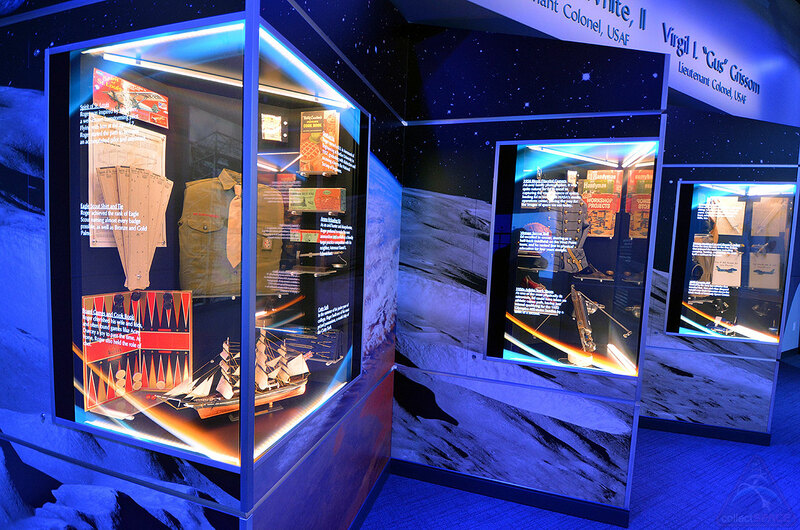 "We loved that image because it places them as heroes," said Luis Berrios, senior design specialist at the Kennedy Space Center, who lead development of the exhibit. "Here they're towering and looking down the length of this whole building, calling to us to go through this experience." 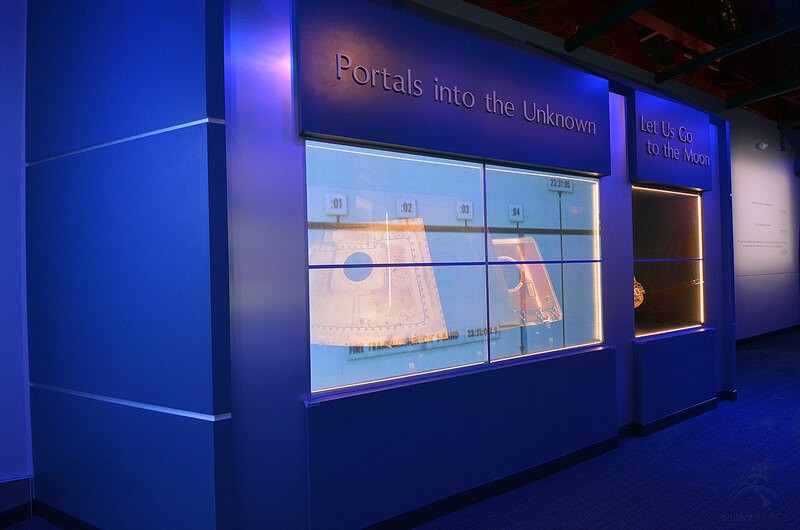 Through both physical and metaphorical "portals" — which Berrios describes as being "magical transparent doors that all of us have to cross at some point of our lives" – visitors discover not only the grim reality of the 1967 fire, but also who Grissom, White and Chaffee were in life and why their sacrifice was not in vain. "Our goal was to not skirt away of the issue of the tragedy, but we did want to celebrate who these guys were," stated Johnathan Kihn, who is Berrios' counterpart at the visitor complex. 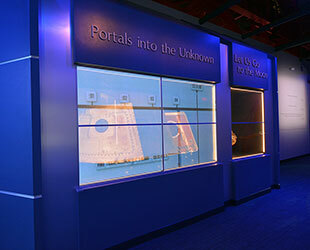 As such, as guests steps through the first circular doorway (or portal) into the exhibit hall, they find three display cases filled with artifacts relating to the three crewmates' lives. 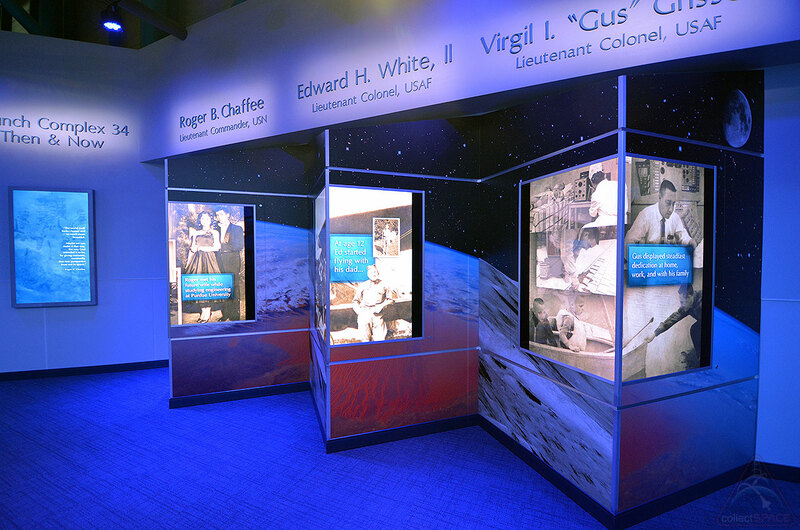 Or, depending on when they enter, visitors may see three video screens showing photo montages of Grissom, White and Chaffee instead. "You have these videos and it kind of fades and then you see what is inside the case," Bonnie White Baer, astronaut Ed White's daughter, described after seeing the exhibit for the first time. "It is really state of the art." Each case in "Ad Astra Per Aspera" is a transparent OLED display capable of showing video and other digital content on what appears to be clear glass. "It is a new technology for flat screens," explained Berrios, adding that it is the high tech version of a theatrical scrim, which both reflects and transmits light, so it can appear to be opaque one moment and transparent the next. 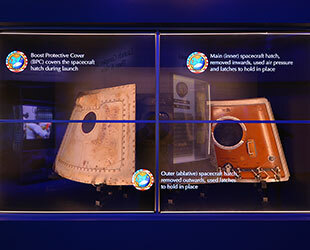 The effect, as used in the Apollo 1 exhibit, adds context to the artifacts that are presented behind the screens, both in the form of brief videos and descriptive text. On Jan. 27, 1967, Grissom, White and Chaffee strapped into their seats in the Apollo command module to take part in a routine "plugs out" test, when an electrical short gave off a spark, igniting the pure oxygen environment. The three astronauts struggled to get out, but the mounting pressure inside the craft made moving the inward opening hatch impossible. "Within seconds of the first [fire] call, the vehicle basically exploded on the inside," recounted John Tribe, who was a member of the Apollo 1 launch team. "The pressure vessel ruptured and that threw debris through the access doors of the command module that spread across the eighth level [of the gantry tower], burning technicians, setting fire to the papers on the desk of the pad leader and the flames licked up the side towards the live launch escape rocket that sat on top. The situation was extremely dangerous." "Six [techs] in pairs of two entered the white room, which was full of black, toxic smoke," Tribe said. "They could not breath, they could not see. They burned their hands, but they finally got those hatches off. Unfortunately it was all in vain." 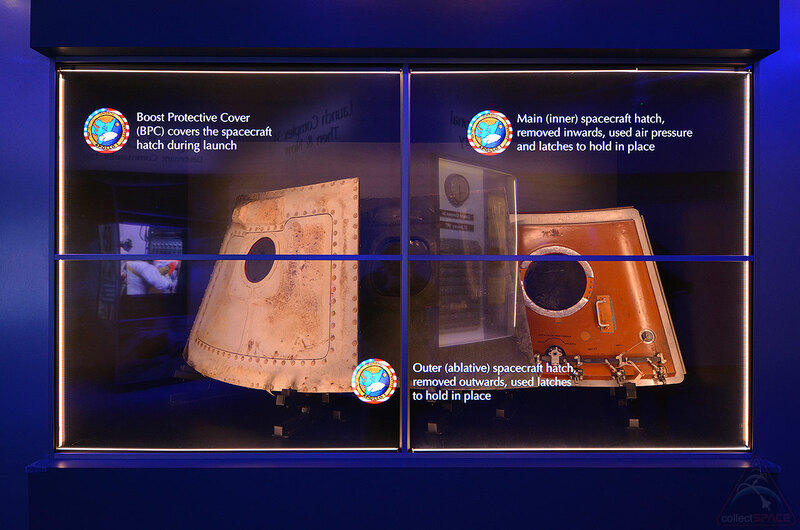 As the central display case in "Ad Astra Per Aspera" fades from a video montage to clear glass, visitors get their first look at those three hatches — the outer boost protective cover hatch, the heat shield hatch and the inner structure hatch — that sealed the astronauts' fates. "A lot of people do not even understand that there were three hatches, let alone the generations that followed, who were born long after this event took place — they do not remember these," said Berrios. "We wanted to make [their display] very intuitive and easy to understand, and tasteful and ethereal, so that people can see that this was a tough thing to see and go through, but maintain the dignity of it as well." 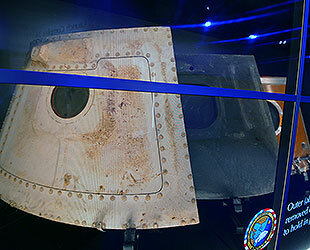 The hatches are presented exactly as they were found in storage at NASA's Langley Research Center in Virginia. "Once they were transported from Langley, we worked with our conservation and preservation team and began to do just some due diligence, some treating and overall display readiness, getting them ready to place in the cases," said Berrios. "Very minimal really, some stabilization, just some light cleaning, but nothing was taken off of them, from their provenance or patina." "I have seen video, I've read quotes, but I had not seen the hatch," said Sheryl Chaffee, who was 8 years old when her father died. "The first time I saw it was powerful." 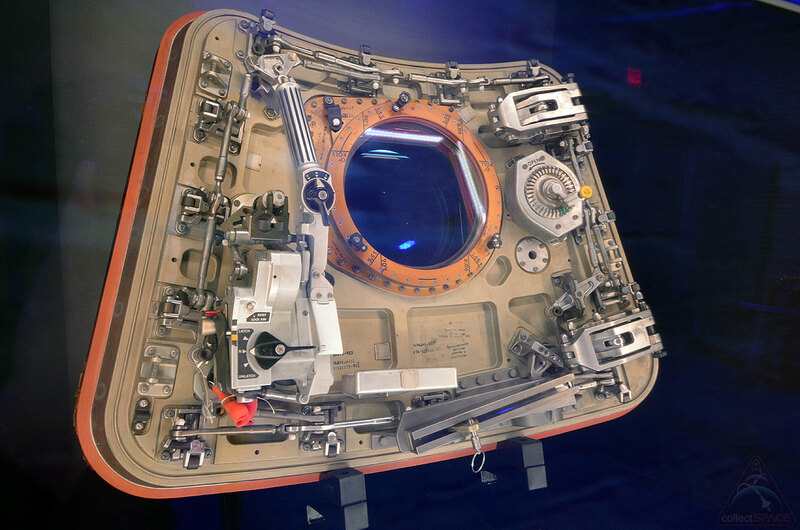 Displayed next to the hatches is what was built to replace them: a redesigned single hatch that with numerous other improvements, made it possible for the command module to safely fly astronauts to the moon. 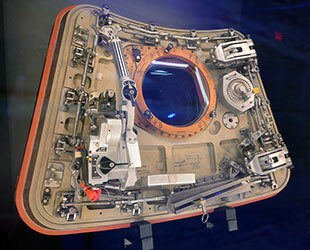 "[We looked] for every conceivable way we could improve [the spacecraft's] performance and safety," stated Tribe. "It went all the way to a new, fast-operating, outward-opening hatch that we could open in 5 seconds, instead of the 90 seconds it took to get the old hatches off." 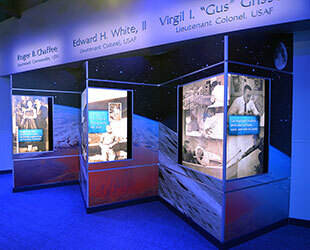 An adjacent display honors the six technicians who fought back flames to reach the astronauts. "Those men fought so hard to get the crew out that night. They were given NASA Exceptional Bravery medals. Their efforts were recognized and have been recognized in the new memorial tribute," Tribe said. 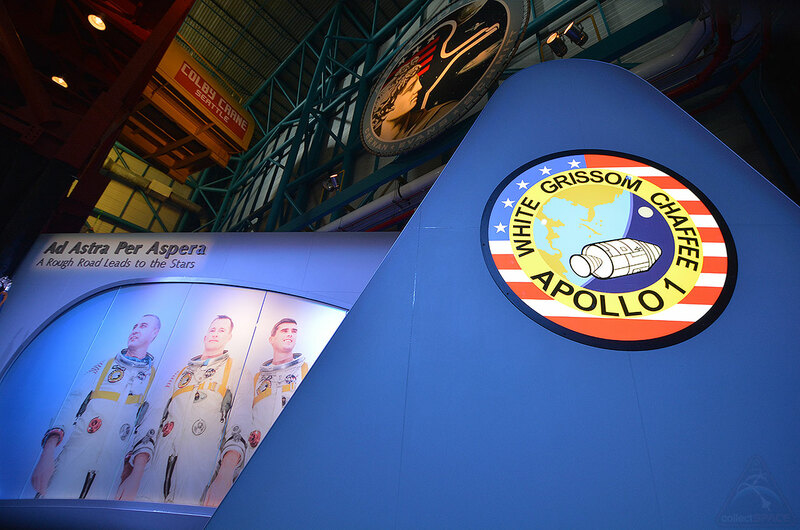 Having encountered the artifacts from the tragedy, visitors are invited to experience the triumph that the Apollo 1 fire made possible. 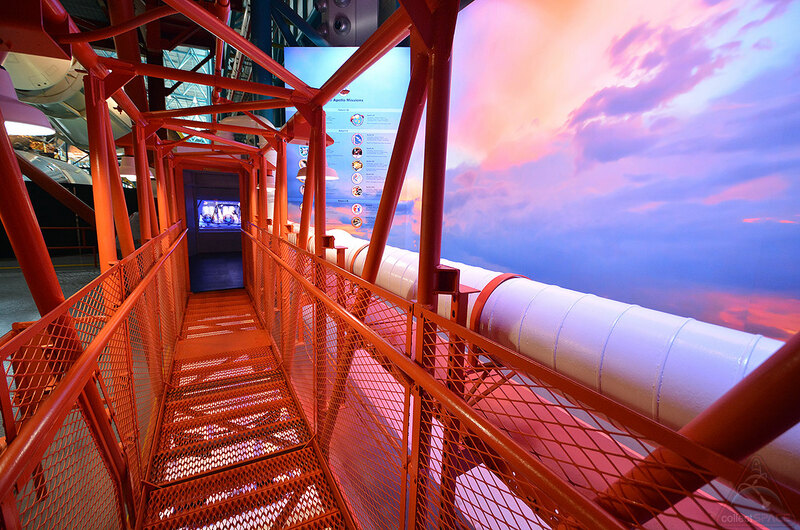 Stepping through a vapor curtain onto which the Apollo 1 crew patch is projected, guests find the authentic walkway that later Apollo astronauts crossed from the gantry to their spacecraft for launch. "We have a cool experience toward the end where we take the 'Heroes' Walk,' which culminates in the same walk as all of the Apollo astronauts," said Berrios. 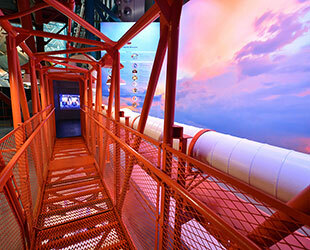 Through forced perspective and a sweeping panorama of the surrounding view, visitors are transported 300 feet (90 m.) above the ground to walk from the exhibit into a replica white room, where they see a crew ready to launch to the moon, before they, themselves, depart to explore the other exhibits in the Apollo/Saturn V Center. "I was amazed that they could do so much," said Lowell Grissom, the astronaut's brother, about the "Ad Astra Per Aspera" exhibit. "It is really a tribute to the crew." 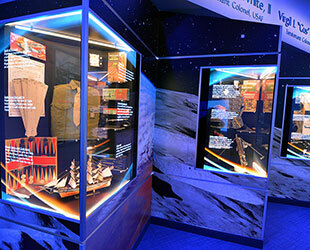 See more of Kennedy Space Center Visitor Complex's "Ad Astra Per Aspera" exhibit in collectSPACE's photo gallery.